Whenever my theopolitical ramblings show my disdain for capitalism, an old friend has taken to calling me a commie. This is just not true. I am not a communist. I would never, ever, ever describe myself as such. I prefer the term anarcho-syndicalist. Yeah, I know, I know. I'm the world's most insufferably bourgeois suburban anarchist. I've named it and claimed it. When I sit in the breakfast nook of my little two-story rambler, I'm not plotting the overthrow of the global hegemonic power structures. I'm just bustling kids off to school, drinking my coffee, and doing church work on my laptop while my puppy snuffs and chews in the background. Yet still and all, if I had to define my political philosophy, it would be some peculiar fusion of Ron Paul and Noam Chomsky, some blend of hopeful American libertarianism and clear-eyed free-will collectivism. The reason for my perspective is, unsurprisingly, theological. 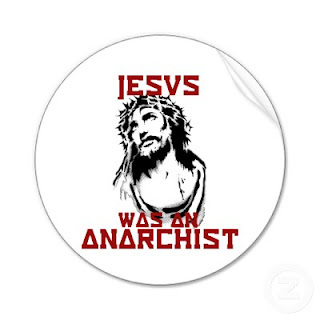 Christian faith is essentially anarchic. It is also syndicalist. Why? An honestly examined Christian faith leads to an anarchist perspective because Christianity is a faith tradition ungoverned by laws. We do not have laws. We have a single defining principle. That principle is the ethos of radical love of both God and the Other. It is a principle not just written down, but fully lived through the person of Jesus of Nazareth. This "law" is not something we perceive as a "law" at all. It is not a coercive mandate, to be imposed upon others by force of arms or force of wealth. Those of us who have tasted of the presence of the Holy Spirit know that those ways of enforcing social norms are shallow, empty, and destructive. They are, to use biblical terms, "powers and principalities," and they cannot define our life together. When we are radically oriented towards the sovereignty of our Creator, those sociopolitical forces cease to have any governing meaning for us. Instead, our governing purpose is an expression of the purpose and design of creation. We act on it not out of fear of physical or spiritual punishment, but out of joy in participating in a grace that radically transforms our reality. Jesus-followers are a people who have moved beyond the need for the Law to enforce social norms or moral behavior. The reality of our participation in Christ renders the law unnecessary. We haven't rejected it. We've just transcended it. That does not mean, of course, that we're out there wearing black bandannas and lobbing Molotov cocktails at our local Dennys. That would defeat the purpose of our liberation. That purpose is...well...not just about us as individuals. Being rooted in a transcendent love, the goal of the Christian is not the furtherance of our own hungers or needs or wants, but the furtherance of that love. We do not burn with the fires of righteous hatred of those who oppress...because in Christ, we love them. It is from that love that the syndicalist part comes in. Here, I wander off a bit from the classical form of anarcho-syndicalism. The "syndicates" that traditional leftism is talkin' 'bout are typically trade unions. According to that model, the way to get things done is to wave flags and parade around and go on strike. Stick it to the Man! Fight the Power! The Free People's Widget Collective demands twelve weeks of paid vacation, dental benefits, and a dark chocolate fondue fountain in the break room! Therein lies the problem. Trade unions and other associations of common material interest are absolutely crappy at expressing the ethic that Jesus taught. While individual members of those associations might live according to the Great Commandment, the associations themselves seek their own collective power and profit. Individual human beings are capable of repenting and changing their attitude towards others. Nations and corporations and unions and associations have a much, much harder time doing this. So instead, I see the shared expression of our anarchic faith played out most perfectly in the church. Why? Churches...real ones...are free associations. They act collectively out of a sense of shared purpose, undertaken devoid of coercion. While they have governing structures, real churches view those governing structures as structures of convenience, ones that are inherently imperfect. I follow the Presbyterian Book of Order because it helps frame and guide our life as a community. It does not make me better than Baptists, or Pentecostals, or Episcopalians, or Catholics. Well, maybe a tiny bit better than Pentecostals, but not so much that Jesus cares. Real churches...meaning ones that exist for the joy of expressing Christ's love...also intentionally struggle against the power dynamics that can corrupt the lives of secular collectives. The church exists to serve others, and to support others, and to share joy with others. Healthy congregations look beyond themselves and don't see a world full of infidels, heretics, and enemies. They see children of God who are worthy of the free and generous application of God's love. Period. I may have some difficulty persuading my session that we are, in fact, all Christian anarchists. A presbyterian anarchist seems almost a contradiction in terms. And yet, if we have the awareness that it is not our structures but the Spirit that matters, we are.